A Fresh Light Treat With Yogurtland & New Summer Flavors! This June, Yogurtland, the ever-popular, industry leader, is expanding its flavor offerings to include three new handcrafted flavors including their first ever light ice cream flavor. Beginning June 18, and available for a limited time, the Yogurtland flavor lineup will include Butter Pecan light ice cream**, Blue Raspberry Sorbet flavored with Jolly Rancher and Cookies and Crème Smores frozen yogurt. The first-of-its kind, Butter Pecan light ice cream** expands on Yogurtland’s ice cream offerings, providing incredible smooth taste with reduced fat. The new Butter Pecan light ice cream** combines flavorfully nutty pecan notes in a creamy base for a mouthwatering guilt free yet indulgent treat. Yogurtland’s Blue Raspberry Sorbet is made with Jolly Rancher® blue raspberry flavor, celebrating one of the many flavors of summer. I'm sure to be our family favorite... Inspired by summer campfires, Yogurtland’s new Cookies and Crème Smores brings summer’s favorite treat to froyo. Combining notes of real chocolate cookie, marshmallow and milk chocolate, this flavor will have fans thinking of summer nights with each bite. Yogurtland’s flavorologists continually create craveable flavors that keep fans loving their frozen dessert experience. 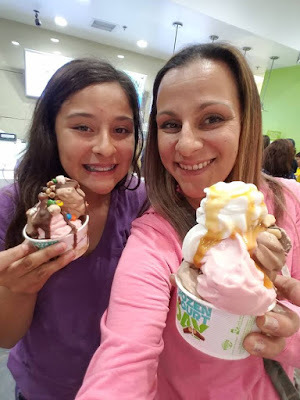 Yogurtland owns its own dairy, and by controlling the manufacturing process, the company delivers the highest quality flavors, setting new standards for the industry and delighting guests each day. 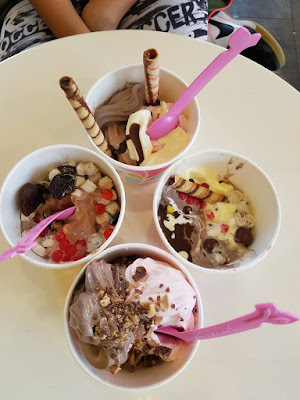 Yogurtland features non-fat and low-fat yogurt flavors, ice cream, and non-dairy and no sugar added choices while using milk that contains no antibiotics or added hormones. Fruit flavors are fortified with Vitamin C for an extra boost. Presently Yogurtland has more than 320 locations across the U.S., Australia, Dubai, Guam, Myanmar, Oman, Singapore, Thailand, and Venezuela. Flavors are always subject to creative change and popular demand. For more information, visit http://www.yogurt-land.com or http://www.facebook.com/yogurtland. Happy cooling off in the summer heat... let us know your favorite summer flavor and keep an eye out for a giveaway to Yogurtland to celebrate National Ice Cream Day on July 15th!